An exponential equation is one in which a variable occurs in the exponent. if bx = by, then x = y (where b > 0 and b ≠1). If the bases are the same, set the exponents equal. 1. Isolate the exponential expression. 2. 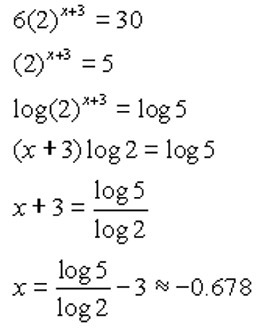 Take log or ln of both sides, to set up the inverse relationship between exponentials and logarithms. (where a > 0, a ≠1, and logaax is defined). 4. Solve for the variable. * Can you see how trying to get a common base for 5 and 7 would be an extremely difficult task? The log method will save us a good deal of aggravation on this problem. Also notice that the solution can be found using either log or log5. • Take the log of both sides. • Apply the log power rule. • log base 5 can also be used as a solution method. • notice how the log5 of 5x is really composition of inverses and yields x. • Notice the change of base formula used at the end for the calculator. Since the natural log is the inverse of the natural exponential function, use ln to quickly solve this problem. • First, get rid of the coefficient of the exponential term (divide by 150). • Now, proceed using ln to quickly solve. • Do not round too quickly. Be sure to carry enough decimal values to allow you to round to thousandths (in this case) for the final answer. 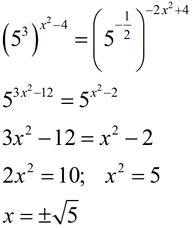 • Remember that ln x and ex are inverse functions. This question requires some additional thinking. Because of the differing powers of e, our previous methods will not be of much help. We will need a different strategy for this problem. • Both solutions are answers.